Quebec, of course, has a rich history in mining – primarily base and precious metals. Lithium is the proverbial new kid on the block and the province is poised to become a major producer in the next few years. All told, seven lithium mines are in development and North American is leading the pack. A company called Quebec Lithium (later RB Energy) built the mine, mill and a refinery between 2012 and 2014, but ran out of funds at the commissioning stage and wound up in receivership. Jilin Nickel, a Chinese company, acquired the assets in 2016, formed North American Lithium and later sold it to Contemporary Amperex Technology Co. Ltd., which is based in Nindge, China and is the world’s largest manufacturer of lithium-ion batteries for electric vehicles. Blanchette and his team restarted mining operations in February 2017 and by June were ready to begin processing the ore using conventional crushing, grinding and flotation technology. By November, after considerable trial and error, as well as consulting with equipment and chemical suppliers, they began to get predictable results. Ore that went into flotation with 1.2-1.6% lithium came out as a spodumene concentrate containing 5.5-6% lithium – a commercial grade concentrate. The mill is designed to produce 200,000 tonnes of spodumene per year and by late 2018 was operating at about two-third capacity on average. North American currently employs 300 people, but that figure could grow. The next stage in the project, Blanchette says, is to activate the refinery, which was designed to upgrade the spodumene to battery quality lithium carbonate. The next advanced project in Quebec, Nemaska Lithium’s Whabouchi mine in the James Bay region, and its electrochemical plant are in the construction stage. The company expects concentrate production to begin in the second half of 2019, followed by lithium salts production about a year later. Sayona Quebec, a subsidiary of Australia’s Sayona Mining, has completed a definitive feasibility study on it Authier lithium project, which is located 45 km northwest of Val d’Or. The company purchased the property in 2016 for a mere $4 million. “They wanted to buy an asset that could be operational in the next two to three years to catch the wave of demand for lithium,” says Sayona Quebec general manager Jonathan Gagne. He and his team hope to begin construction in second half of 2019 and to begin mining by the end of 2020. They are planning an open pit mine, which will eventually be 1,000 metres long, 600 metres wide and 200 metres deep. Based on reserves of 12 million tonnes and a resource estimated at 21 million tonnes the mine could be in production for 18 years and employ 160 people at peak production. The company plans to sell spodumene concentrates initially, but is studying the feasibility of developing a downstream processing facility to produce lithium carbonate or lithium hydroxide. Montreal-based Critical Elements is one of several companies with a project in development in the James Bay Region. 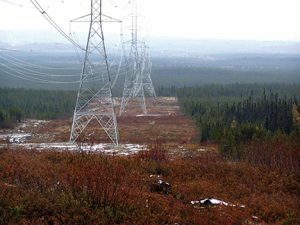 Its flagship Rose project is located 40 km north of the Cree village of Nemaska and has access to a nearby road while hydro lines pass right over the site. The company has completed drilling and exploration and has reserves estimated at 26.8 million tonnes. It has also completed a feasibility study and submitted an environmental impact study to the federal and provincial government. CEO Jean-Sebastien Lavallee says the company is working on plans for an open pit mine with a life of 17 years and capable of producing over 186,000 tonnes of spodumene per year. As well, the company is currently looking for an equity partner to help finance the $400 million project.